Happy New Year to all! To kick off 2019 in style, the Montclair Orchestra dives right back into action with its next season concert on Sunday, January 13 at 3:00 pm. In Montclair we’ve branded ourselves as “The Orchestra for the Next Generation,” referencing our unique mentorship system where top conservatory students from the Tri-State area play alongside leading professional musicians from the Metropolitan Opera, New York Philharmonic, New Jersey Symphony, and other major orchestras in the region. Having the opportunity to make music at the highest level is a true gift, but sharing the stage with the next generation of musicians makes the experience that much more special. 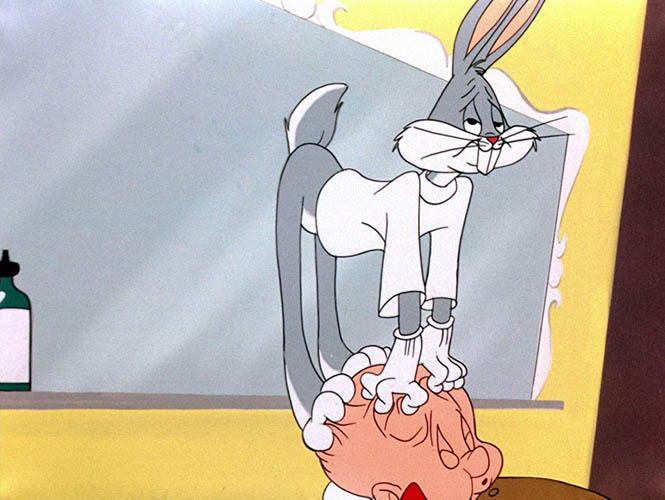 “Rabbit of Seville” (1950). I guess you could say this program has a rabbit theme. In this program, we also tend to the other “next generation”: the next generation of audiences. Our annual Children’s Concert is back, bigger and better than ever with New Camerata Opera’s production of “Peter Rabbit.” This charming production is based on the Beatrix Potter classic and set to the music of Donizetti’s eternally fresh L’elisir d’amore. The program also includes the first movement of Beethoven’s Fifth Symphony (which opens with perhaps the most famous four notes in all of music) and the overture to Rossini’s “Barber of Seville,” as well as other favorites by Edvard Grieg and Johann Strauss. To make this an interactive, hands-on experience, there will even be a percussion petting zoo at intermission, where kids aged 2-99 years will have the chance to bang, strike, shake and thump percussion instruments to their hearts’ content. Who could ask for anything more (apart from maybe a pair of earplugs)? This popular event will be sure to sell out, so don’t delay getting your tickets, available online here.